If the portion size is large Emily often has the entree size for her main course. Our family often share so that dishes are in the centre of the table for everyone at the table to enjoy. One portion of fried potato chips served four of us at a recent restaurant meal. Dressings can be high in fat, salt and sugar. Emily and I often ask for salad dressings on the side, that way we can decide on how much our food is dressed. We are aware that dishes with cream, cheese or dishes with coconut milk or peanut satay sauce are going to be high in fat and kilojoules. A tomato based sauce is a better choice. 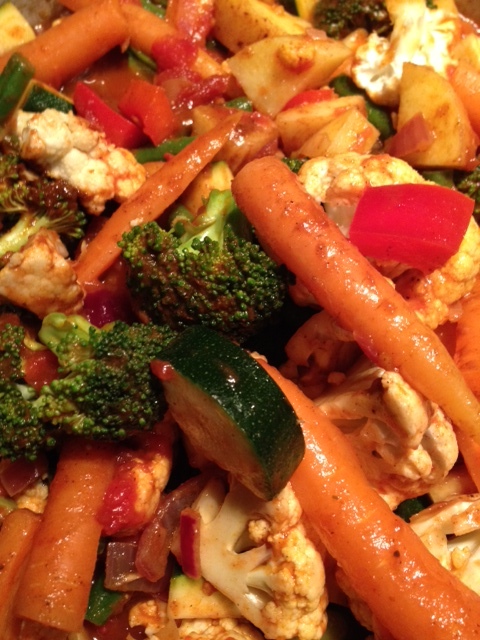 We include vegetables with our meals , steamed, stir fried or salads (without dressing). We do love desert so have been known to order one sweet with five spoons. A creamy panna cotta is my favourite but I only need a mouthful so sharing is the perfect end to a delicious meal! Most restaurants do their best to accommodate individuals. I was always reticent to ask but our tiny nuances like salad dressing on the side or more vegetables, skim milk not regular milk in tea and coffee are all reasonable and small adjustments are not inconveniencing staff so I ask more readily nowadays. I don’t want to give up any taste or enjoyment at meal times and by simply making healthier choices we can satisfy all our nutritional needs especially when outside the home. Asian – healthiest options are stir fried vegetables, braised meat and steamed rice. Bistro – healthiest options are grilled meat, steamed vegetables and plain bread. Indian – healthy choices are Tandoori, cucumber raita and roti. Italian – healthiest options are napolitana, marinara, thin crust pizza. Mexican – healthiest options are salsa, chilli con carne, taco, burrito, fajita, paella. Breakfast – healthiest options are poached eggs, spinach, tomato and grainy bread. I took an onion, sliced, diced and fried in a little olive oil. I added all the fresh vegetables I had in the house – broccoli, cauliflower, zucchini, potatoes, baby carrots, red pepper, french beans and tomatoes (a fruit) diced. I added two tablespoons of good quality curry paste and stirred in a little boiling water, I wanted the sauce to thicken. I let the vegetables simmer while I steamed some nutritious brown rice. The carrots were still crunchy when I served the dish, absolutely delicious, fresh and healthy. This entry was posted in Lifestyle Choices, SCI Diet and tagged Carer Support, caring, Diet, Dietitians Association of Australia, Eating Out, Everyday Caring, food and nutrition, Healthy choices, Nutrition, Restaurants, SCI by everydaycarer. Bookmark the permalink.